Aluminium has been a catalyst in Steel making by removing trapped oxygen from molten steel. Traditionally the aluminium in various form was used for deoxidation without fully understanding its cost and recovery on the final steel. Traditionally DE-OX was used by various customers in various forms depending upon the size of charge, the type of alloy steel and design of the plant. Surprisingly some steel plants used aluminum scrap in place of aluminium alloy deoxidants. This led to higher cost of deoxidizing and sub optimal quality with higher rate of rejections and poor realization in final steel. With our experience and continuous improvement philosophy motivated us to find solution to this problem. With the help and support from all our existing customers and their team we have been successful to invent Aluminum Alloy Flipped Coil. Very few steel plants in the world have designed considering the deox usage with Flipped Coil. We spent time and resources at our plant and at clients shop floor for designing the usage with high speed feeding machines at electronically controlled speed. Higher recovery of aluminium in finished steel. SFC Group's Philosophy is not to supply DE-OX as a commodity but to give them de-ox as a solution to our valued customers. 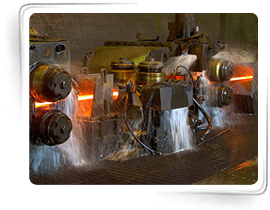 We have innovated in supplying DE-OX based on finished steel output with some of our customers. We have innovated in supplying manpower & SPMs to our customers till the time they feel comfortable with the system on BOT basis. SFC Group is having installed capacity to manufacture about 40,000 MTPA of various kinds of DE-OX. The plants are based at Economic Capital of Gujarat which is having the largest ports for international trade. The people of Gujarat are blessed with entrepreneurship and the state is blessed with peaceful industrial climate. The SFC Group has got well equipped infrastructure for melting and manufacturing wide product range. In house workshop helps the group to maintain good health of the plant ensuring timely delivery to our customers.